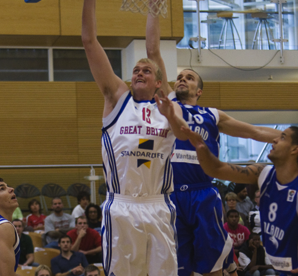 Great Britain Standard Life Men’s Squad kicked off their EuroBasket Qualifiers campaign on the right note, when they defeated the home team Hungary, 91-82, Monday. Chicago Bulls forward had a dominating performance, tallying 32 points, nine rebounds, three assists, and two steals in his first game with the team this year. Former NBA protégé Pops Mensah-Bonsu also lived-up to the expectations when he scored 14 points and grabbed a whopping 18 rebounds. “Every win is important especially on the road. Two years ago we lost our first qualifying game and we had to climb up the hill then. But I think the experience of some of the guys from that situation brought us through here.” said Deng, who opened up the game with a three-pointer and chipped in 11 points in the first period. Nate Reinking had 16 points, while Dan Clark, who previously promised to have a good performance in the qualifiers, added 14 points in his first start with the team in a major tournament. Deng and Mensah-Bonsu led the team’s attack in the first half, giving GB a two-point cushion at the half. Hungary caught fire in the second half and even led at the start of the final period, 71-67, but Deng, Mensah-Bonsu, and Reinking took charge in the crucial moments of the game. Adam Hanga led Hungary with his 20 points and ten boards, and David Vojoda contributed 18 points for the losing team. GB Head Coach Chris Finch was delighted with how the team played, but said that the road will be a lot tougher in the latter part of the tournament. “This was a big win for us. Hungary is very good and they shot the ball well in the first half. We made some big plays down the stretch. The guys gutted it out. Wins on the road in this group are worth two.” Finch said. GB will host Macedonia, who defeated Ukraine 71-58 in their opening game, on Sunday at the University Sport Central in Newcastle. “This next week is really important as we have a bye which provides several days to work on some key areas. It’ll be good to get to work in Newcastle.” Finch said.